A mate of mine is looking for an 80's Fruit Machine from the wish list below. I was going to recommend Jamma to him but I see it is no more! Yep you are going to need deep pockets to pick up one from that wish list. Put a ask out on MPU Mecca as well. I best hang on to my mk3 then. I'm a fruity fan. I've started building my own touch-screen system that runs all the machines ,80's onwards emulated via MFME and other Windows fruit machine emulators. I used to own the original machines, Lite a Nudge, Eachway Shuffles, Line-ups etc but have found that if your'e more of a fruity player than a restoration guy this is the way to go. 99% worth more in parts especially when it costs £20 to upgrade to new £1 coin . I think if you're like me & grew-up on a seaside town in the 80's chances are you spent a lot of time in the arcades. Pinball was there of course and was a big part of the it but so were the arcade machines, Defender, Tempest etc and fruit machines also made up the experience. For me it's not "winning" money (since you can't) it's just the noises, the lights, the game play, that conjures-up the feelings you had back in the day! Taking that "10p" win up to £2p and hearing that jackpot noise again, just momentarily takes you back . Difficult to explain... we're a weird bunch for sure. 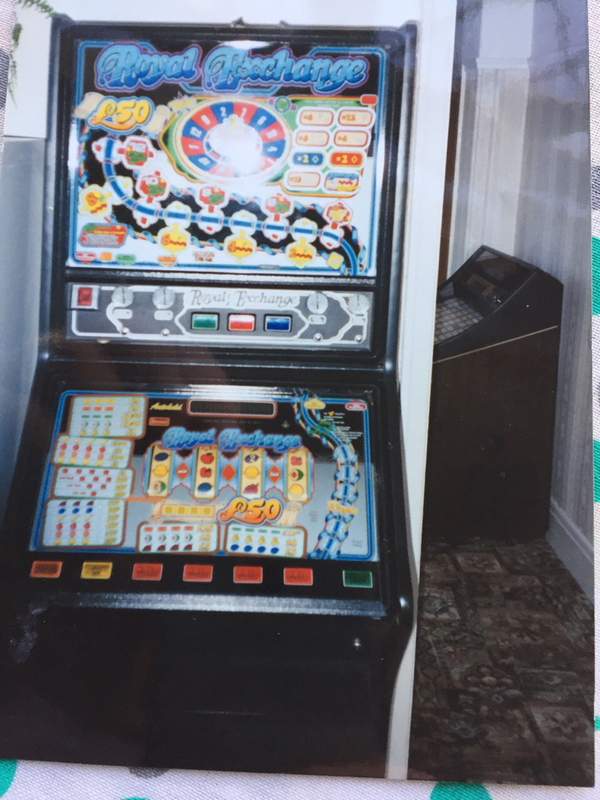 Find many great new & used options and get the best deals for JPM Clickety Click System 80 vintage fruit machine from the 1980`s at the best online prices at eBay! Free delivery for many products! I am like you - Skegness (they had a good Grammar school!) - and i do remember them fondly. More 90's for me, but same sentiment. Learning the marked cards on BWB videos like Monte Carlo Or Bust was handy, and knowing some of the programmed behavioural cheats on Barcrest & JPM also. In the Summer seasons you could make a decent second wage! I've had a few fruit machines, but all for nostalgia only. Miss my JPM Big Banker more than i'd expected. I had a JPM Roadrunner in the eighties, wish I still.had it... Also had a Royal Exchange when living with my parents in my bedroom too..... Happy days. Just picked up a JMP Indy jones and also a cops and robbers, both just for sh1ts and giggles as part of the 'bar' theme for my new pin shack and both cheap a chips. Will need to tinker with them both to get them taking new pounds but that'll be part of the fun! @Monkeyboypaul are these secret cheats listed anywhere online?! Also any idea where to find manuals for these?! I had a JPM Roadrunner in the eighties, wish I still.had it... Also had a Royal Exchange i my bedroom too..... Happy days. Nice one, I loved that machine..
Also had a Rock-Ola 477Max, it had a fantastic sound to it.. sold it for £300, think I sold bandit around the same time for £50 ?? 3 or 4 reel Cops N Robbers? Indy’s fun, not my favourite JPM impact machine, but still fun @20p play £6 jackpot. Like Pinball’s, make sure any motherboard batteries are fly wired well away from the PCB - usually a crappy little Varta thing. On the JPM it’s a plug-in cartridge that needs sorting. JPM were bought by SEGA and first fruity was the brillaint SONIC THE HEDGEHOG. However SEGA wouldnt make a Sonic pinball as pinball is for adults! So gambling in a pub is ok then ?!? It was - very popular game. A full Hi/Lo climb to Jackpot on Nemesis was very cool! Big Banker and Big Bucks were my favs - full of features, interesting gameplay, not all obvious. Never got to play Big50 in the wild, and still not DX'd in the emulation scene. Wasn't sonic just a re-theme of RollerCoaster? Similar feature board progression. Have had all of those, big banker, big bucks, also had rollercoaster both club and awp, the monopoly anniversary edition was also good, I got good money selling it at the time, Had a sonic also although the glasses were peeling badly. Had a few indy jones last one went to Norway! 4 reel deluxe edition, im wondering if this had the blue flasher on the top like the original but i read they had to remove the flashers as people kept thinking thw pub was being raided by the fuzz! Ijust spoke to a guy in Glasgow who will help me get them updated to new coins and a brief intro to how it all works etc so all good but thanks for the tip on batteries, indi hasn't got one fitted as far as I can see, not necessary in home use in was led to believe and better off without. I remember a casino themed game from my youth if anyone knows what that was, had a selection of table games on it, Ceasars Palace maybe? Casino Crazy? Another in the Grey JPM Vogue cabinet, like Indy. Indy should have a battery, on the Processor/CPU board possibly concealed behind the casing. They’re £50 plus (last time I checked) to replace that board, if you can find one. Like Pinball B/W CPU boards, it’s that part that gets damaged by the batteries, so that part which becomes scarce, therefore harder to find and replace. Swallow amusements did my coin mechs I think. It’s been a while though. Monte Carlo or bust video fruit? Jon it's possible to change the impact board over to the newer impact 2 tech, it's newer with less cards. you will need the impact 2 mpu along with it's rom card to swap your indy roms onto, But I'm not sure if your indy works or not? Nope not Monte Carlo or Casino crazy but thanks for the suggestions guys, I'll keep hunting! Thanks @ronnie63 for the info, it's working fine, just takes old coins and needs a good strip and clean which, like pinballs, is part of the fun! I don't even know if the bulbs are 555 or different yet, any ideas? !